I used to love to walk among the trees along shaded paths. I still enjoy this back to nature feel. So I created a series of 6 such walks through the trees, all titled Peaceful Splendor, and named them 1-2-3-4-5-6. very creative naming I thought. Each was a different area, yet the same peaceful feeling. This is #1 and #2 of the series of 6. All are 11" X 17" and framed in a beautiful cherry finish frame. They were shown at a recent art guild showing, but no offers to purchase. I hope to show all 6 of them in the near future. I am a bit of a Sherlock Holmes, detective. With my sleuthing, I was able to locate this gifted man. Not to reveal how I did it. He politely gave me a one on one interview. I am an amateur reporter. He shared his fathomless endless ideas of his paintings. So a revelation here. Remember I said I was an amateur reporter and detective. The revelation? He has worked for over two years creating "PEACEFUL SPLENDOR - SERIES 2. All this after a couple hospital stays and personal tragedies and problems. These scenes reminded me of something from my past, oh so many years ago. OK, I'll reveal it was more than 70 years ago. GRADE SCHOOL: Teacher showed the class a picture and we were to write about our feelings when we saw this picture. When we were finished, we were to place the paper on her desk and we could go on home - early. Class clown wrote one sentence and placed his paper on her desk, and he was out of there. I wrote a full page expressing my inner feelings about the picture. I poured my hear out. I was hoping to get an "A" for my composition. Next day we got our grades. I got a "B" for my hard work. Class clown got an "A". He wrote, "Oh, how I wish I was there." One stupid sentence and he gets an "A". My career? I became a college professor. I was at The Wings Gallery at The College of DuPage and saw these two paintings there on the wall. The exhibit was presented strictly for veterans that are students at the college. Then I was handed a small card with this address. What a revelation. What a thrill to have seen something so beautiful, and now from the comfort of my home, see it again and share it with my family and friends. I'll have to get back to the gallery again before they are returned to Ted. Ted asked me to view some of his art and I can honestly say I was speechless. He truly has an amazing talent. I truly enjoyed viewing all his work! During our vacations camping, Dad just loved to go for walks, and hikes on the trails in the campgrounds, while us kids just wanted to hit the playgrounds and go swimming. But we relented and always enjoyed our walks with him. 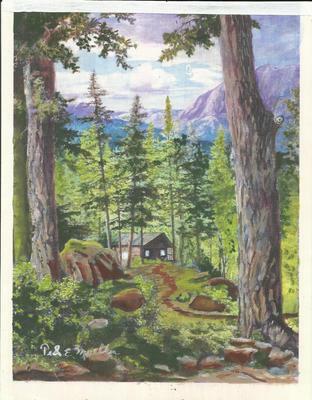 What wonderful memories of our camping vacations that these paintings these bring back! Keep up the good work, Dad! This Ted fella must have a photographic eye. I looked at these two paintings and the realism is super. 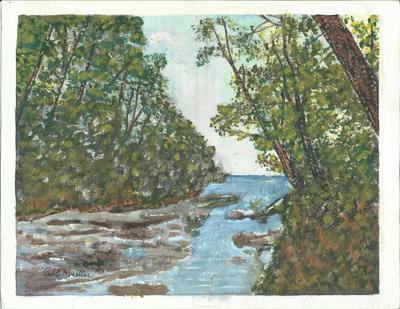 His brush strokes are so miniscule it is barely detectible that he used a paint brush to create this memorable painting. If he hangs it in his home it is a waste because it belongs where public can view it. I say it is a "gallery" type of painting. Only a naturalist can appreciate this scene. I love to walk in the country and this inspired me to go out for a walk. Only when I got to the door did I realize it's winter and there is snow out there and its COLD ! But I was warmed with the painting. The assignment was to write a composition about feelings we had after she showed us a photograph slide projection. The class clown wrote one sentence, whereas I wrote a whole page expressing my feelings. Clown received an "A", and I received a "C". "OH, HOW I WISH I WERE THERE." Ted's wife was hospitalized for a heart treatment and she was so proud of his beautiful paintings. She gave me this address and I forgot to look at it, then remembered the note from her. I only wish I had looked sooner so I could have responded to her personally. These are BEAUTIFUL ! Splendor is such a fitting title as that is what they are. Bold images, yet simple everyday viewings available to all. Fascinating scenes invoking the viewer to look deeper and immerse themselves into the image. Masterfully executed and causes the viewer to want to see more. Close your eyes and imagined you're walking in one of these great scenes. Get your imagination going, and enjoy your walk. I enjoy looking at scenes of nature when I am stressed. These are beautiful and take me back to my childhood. On camp outs my dad and I would walk the campground roads and hiking trails, sometimes sharing in conversation and at times just listening for the birds, squirrels and other small animals. We would check out the wild plants and their flowers as well as the smells of nature. I do not have this talent for painting/drawing but enjoy the works of others. These are a true treasure. I was proud to have treated this artist's wife while she was in my care in hospital. She showed me a picture of The Last Supper and then a picture print she had of #1. She is so wonderful and appreciative of her husband's beautiful paintings. Even gave me address to see them here. Will hope to see many more soon. My cousin Ted is a fantastic artist. He captures the pure essence of each topic of his paintings. His latest series of peaceful reminiscences of walks in nature are superb. As a child, I considered myself an adventurer. I have negotiated my way on similar paths & roads, overlooked fields, old fences, and 'worry how to get back to my starting point or home'. At times I felt I was an explorer, seeing this scene for the first time, I was discovering new worlds, new areas to pass on to others. Many times hoping not to get lost and have to be rescued myself. 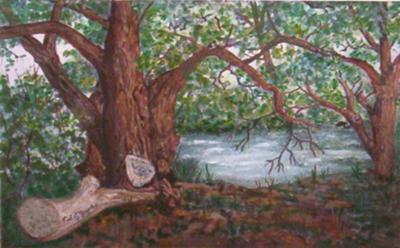 But these paintings are back to nature, enjoying the 'outdoors". No one had had to rescue me. But I thank this artist for my walk through the woods and my imaginary trip back to nature. He has a photographic eye with his paint brushes. I look forward to see more of his work. Ted has captured two of the most beautiful scenes. I can visualize these same walks with nature. Both are so real, I at first thought them to be photographs, but I have seen Ted's work before and know his works to be detailed paintings. He is so meticulate with his paintings, so exacting and attention to minute detail. I anticipate seeing the other 4 paintings of this 6 painting series. The wife of my church/school principal was hospitalized for about 2 months. He showed me a photo his wife had taken out of their kitchen window of their lake side home. It was perfect composition, exquisite framing and it seemed to tell me - "PAINT THIS". I asked him to send me an e-mail copy attachment. The next week I gave him a small print of this picture on an 8"X10" sheet of paper. I had this taped over my 8"X10" painting. I handed it to him and he said, "I recognize this." So I said, "Lift the paper." He was wide eyed when he saw the painting of that window scene. My get well gift to his wife. This series depicts something most just walk through, yet the artist envisions this silent beauty and preserves it for others. Though not a photo, it reveals composition and enthusiasm for the viewer to enjoy. There is a saying to stop and smell the flowers. Apparently TED has the vision to smell more than flowers. As someone commented, "he has his head in the trees" is a somewhat complement, but he has captured the sense of our world's beauty that is there for the looking if one will just stop and admire. TED has stopped and sees it and presents it for others. He shares his visions for all viewers. That sure looks like a photograph and reminds me of all the summertime picnics we had at Blackwell Forest Preserve. 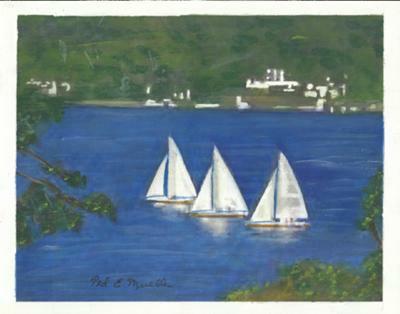 OK, the lake was small, and so were the sailboats, but what great times we had. It is winter now in the Chicago area. This warm scene helped to warm my spirits. If this is referenced to a photograph, the photographer is superb. Then along came Ted the artist and put it down in such realism. Yes, it really warmed me up to see such beauty and composition. Framed in a window view gives me, the viewer, an appreciation of what others view as art and the scene is memorable. Congratulations to two artists, each in their field, and so many viewers can also see and share. I have the pleasure of knowing the artist and also seeing Lake Boats "in person". Ted is a natural when it comes to capturing "God's great splendor". We in the Addison, Illinois area, are all very proud of Ted and his "Works of Art". I have looked at all 6 'Peaceful Splendor' paintings. All are such beautiful showings of God's wonderful exhibits that we take for granted each day. Each is fantastic showing of the actual greatest artist, GOD! Looking at them, I felt closer to Him. Principal's wife is an artist too, but her's is with a camera. That scene must have been a fleeting moment as that could not have been posed, no way. And if this is out her window, she must have a most enjoyable view many times. And to illustrate this scene on a canvas, two artists each show their talent. Peaceful Splendor and agree, the title is superb, the paintings are superb, composition is beyond comparison. I am delighted to say I captured each picture in my imagination and then with eyes closed walked around the area. Such realism in these paintings must be enjoyed, such as I did. A walk in the park, and I "was lost". No one rescued me as I opened my eyes and came back to realism. These paintings are extraodinary! And I enjoyed my walk. Picture captured exactly the boats going by propelled by the wind. Beautiful picture! This man sure does know how to paint. His eye is fantastic, and such subject matter is overwhelming. Apparently he knows his boats also. It looks like a photograph...I love it. This artist recognizes a beautiful scene when he sees one. And compulsion to paint it is a trait of great artists. The artist is correct, it is perfect framing and composition. And such a scene only appears for an instant. The principal's wife is also such an artist to recognize such a scene and capture it. Compliments all around for this beautiful painting and sharing for many to enjoy. 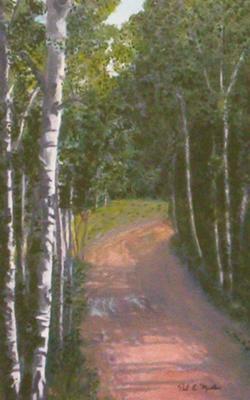 Enjoying peaceful walks along serene paths and enjoying the views was the inspiration of this series of a total of 6 paintings. Each was of a different are yet each had that tranquility of the area that so impressed me. I can still visualize that walk and inhale the perfume I experienced. One cannot "bottle up" such fragrance, yet I attempted to capture the atmosphere of the location so others may experience the same tranquil splendor of that area. I hope I have achieved this venture with this series. OK We took our walks at my wife's insistence. Quite frankly, I still prefer my form of exercise. Looking at travel channel on TV, clicking the remote, and pulling back the lever on my Lazy Boy is sufficient for me. Poets write their thoughts on paper. Authors write fiction or non-fiction stories. Artists place their visions on canvas. This artist knows how to allow the viewers' imagination and visions of their past, actually toplace themselves into the picture. This is an amazing gift, and with "Peaceful Splendor", he has succeeded in what so many attempt and few succeed. I too have walked his pictures in my imagination and then had to return to reality. Great work Ted! Peaceful Splendor is the perfect title. Beautiful!! My parents used to take me for walks in local parks which our county referred to as FOREST PRESERVES. These 'forests' were created by workers in the 30's called CCC camps. CCC referred to Civilian Conservation Corps, which were recruited from unemployed people to give them jobs and some income for their families. They cleared areas and built beautiful shelters for picnics. Many a day we went to these parks, scattered throughout Chicago suburbs, for a picnic lunch and possibly a hike on paths through "the woods". It was a way to escape the every day routine and looking back, it had created jobs and helped a desperate community of willing workers. I cherish the walk through the woods. Yes, this brought back memories of my youth and I had introduced my children to the wonder of nature with our visits. Thanks to this gifted artist for illustrating such wonderful areas and bringing back memories of my youth and my now grown family. Strolls and walks through nature and remembering these wonderful places, I had to record them in paint. 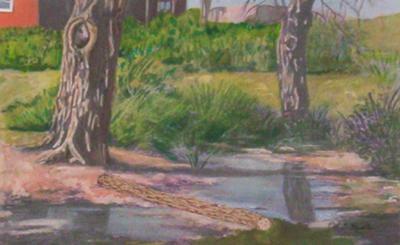 Water color is a wonderful media for mixed media as I am working with acrylic paints and also acrylic as water color. The combination is most pleasant for working and in the end most pleasing results. These are the 4 remaining of the Peaceful Splendor series, Number 3 - 4 - 5 - and 6. All are framed with beautiful dark cherry wood frames. This artist aparently gave my wife a card with an Australia address. She went to her (OUR) computer and the ooo's and awe's coming from the room worried me. So I ventured in to check on her. She was aglow with smiles and after reading the comments about "going for a walk",showed me a few. Then she turned off the computer, said get your sweater, and said, "We are going for a walk." Now she has become a health freak. She insists "we go for walks". She thinks I am over weight and now insists on a short walk every evening after summer. If I walk any more, and lose any more weight, I'll have to invest in a complete new wardrobe. MIXED emotions from me. I hate this artist for creating this new regime, and we both love his idea of taking walks. OK, so I've lost over 10# in two weeks. My recliner has 2 functions. When I am tired, I recline. That involves pulling the side lever just once. EXERCISE !. The other function is as a rocker. To and fro. This is when I want strenuous exercise. Now some have written about actual walks and my wife is on my case constantly. Now my wife is talking about something about I am "off my rocker". Wife and I looked at these beautiful paintings, and your idea of walking got in her head. She commented about my current form of exercise: She thinks clicking the TV remote to travel channel is not sufficient exercise. AND - she went on that the lever on my Lazy Boy does not constitute arm exercise. I'll comment after we get back from "OUR WALK". Ted portrays in his images, a bold majestic sky accompanied by the charm and simplicity of everyday life. He finds both the simplicity of an everyday scene and stimulates the viewer with tantalizing memories of their own. Only a master can achieve such realism. 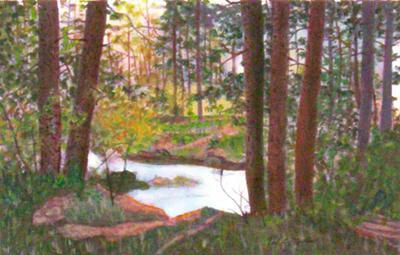 His paintings are an expression of his inward viewing of exciting places, and at the same time loves the rich colors of the forests and parks that are found in his area. The continued success of his paintings will draw the attention of collectors. 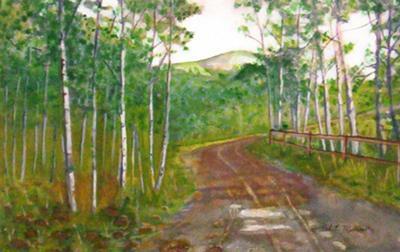 After looking at these beautiful paintings I have a new desire to take a walk in a Forest preserve. I had not realized there was such beautiful areas to enjoy right in my own area. It will also give me a new form of exercise,. I can take a walk for exercise instead of pulling the lever on my "Lazy Boy chair" and calling that exercise. Your paintings are beautiful. I remember seeing some of these in class. What a great title for this series. Looking at them takes me away to a peaceful place. Congratulations. I read previous comments, and heartily agree with all of them. No criticism of the paintings - they are perfect. I have returned to this page several time and each time received such a wonderful feeling. I know a quality picture. I wish I could shake the hand of this artist he is perfect. I live in big city of Chicago. Never realized that Forest preserves could be so enjoyable. I can imaging these may not be Chicago parks or Forest Preserves, but this artist has awakened a new interest for me. I'm going to take a walk in a Forest preserve and enjoy back to nature. Besides many times nothing interesting on TV anyway. A more productive thing to enjoy. Thanks for the insight of a new venture for me. Enjoyed the tour. I could just feel the realism this painter puts into his paintings. I could look at these for hours. Maybe wish I had these on my living room walls. Thanks for the walk through the woods. I was treating this man's wife in the hospital. She was beaming with pride of his wonderful paintings and gave me this address. She is correct with the beauty of these paintings. I only wish I could purchase one of these beautiful paintings. Just looking at them and I could visualize walking these places and enjoying the outdoor aroma fragrences of them. I want to keep this address so I can look again. Serene pictures. Beautiful blending of colors. I enjoy rural America and search for ways to illustrate it. Sometimes I like to inject a bit of humor into the work as I did with this piece. 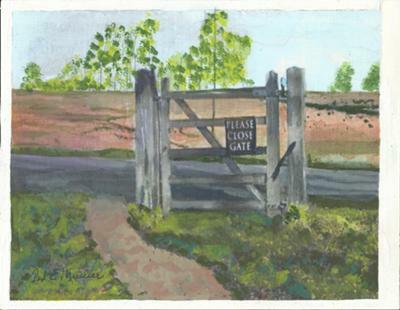 The used path goes around the gate since the adjacent fence has long been missing. Another time I was advised that I had not signed my work of a light house. I directed their gaze to look at the grafiti in the rocks. On a farm scene no one could locate my signature. I said, "See the tree in the foreground and the carving in it?" Another time I used a log and carved my name into it. Painting is FUN. I did a spin off of Andy Warhall with his Campbell soup cans. But, at the bottom was one lone can on its side with the cut off lid hanging on. When asked about the lone can I replied, "Starving Artist." Sadly, this painting was stolen from a classroom studio as someone wanted the frame. I got out a magnifying glass and looked real close at the sign on the gate.. "PLEASE CLOSE THE GATE"
No fence either side of the gate, so every one is just going around the gate. Such humor you create in your paintings. Another of your injected humor in a painting? Since your painting was stolen by a thief, how about a challenge? Why not create it again? Many stolen items are irreplaceable, but since you had the vision to create such a piece, a challenge would be to create it again in all its hilarious pun and chuckles. I love "starving artist" as its title. I would have enjoyed seeing your version of Campbell Soup cans. It must have been hilarious. Your humor is so enjoyable: hidden things in your paintings, so imaginative, so creative. Sign of a true artist. Such imagination. The sign of a true artist, to see something, imagine something and develop a new image. And with humor. I always enjoy your work Ted - love the humor, too! Ted another magnificent true to life painting. It's beautiful!!! Such beautiful representation of rural America. Actually it could be any place. And I love this artist's humor with his deftly injected humor. This is true representation of peaceful areas around us that we may take for granted, yet this artist sees the beauty in this simple piece. Congratulations, you have achieved two things here, beautiful painting and your humor. I adore forest scenes and nature. I have been accused of having my head in the trees. Maybe they are right, because I see such beauty in them, and they are all around us. But one has to travel a bit to see dense forests an beautiful watery scenes. Then to capture them in paint is the challenge that I accept. I tried to select a favorite. First I saw the trees and then the logs floating in the water. Then I looked at the waterfall and advanced to the last 2. Honestly, I liked them all. Each has its own story for the viewer. The now generation seems to have a language of their own. Something is "Awesome" to them. So I take the liberty of using their expression, these are awesome and to be appreciated. If all these were in a gallery or on public display, I could not select one as being more impressionable than another. As someone stated, "You have your head in the trees," but I say your feet are firmly on the ground. And your architectural background is very vivid it your paintings. 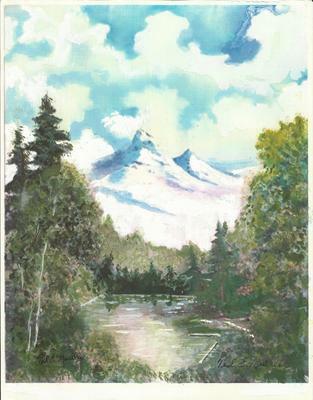 I recently commented to Dad that his paintings look like paint by numbers, and he took offense! Now I am going to explain publicly that it his eye for nature, his memory, and his perfection in his renderings that I refer to in my comment about being "paint by number." I love this series...they are among his best, in my opinion! I am "lazy" and I have an expert that tells me that exact statement. My wife is adventurous, whereas I am content to be a stay at home guy. Just because I like to watch TV sports games and not walk in the country, I am called LAZY. BUT - after looking at these paintings, I must confess I am motivated to "get out and look around". No photograph could capture these scenes and get me to walk areas like these. I now call my walks a health walk. Fresh air and exercise. These scenes took my breath away. Now that I have regained my composure, these are breathless beauty. I will pay more attention to the travel sections of my city newspaper, since these sometimes inspired this artist. I too want to take walks in such beautiful places. America has so many beautiful places to see all around us yet we hurry to places and ignore the beauty so close to us. Thanks for the reality jolt, so I can get some walking exercise. With these as a stimulation I can venture into the woods and farms. You may have your head in the trees, but your paintings are down to earth. Just have to make them so I have a vivid picture of them. Photograph are not personal enough for me. I want to share the beauty of such scenes with others. Maybe some will see the same besuty that I do. I love this painting! I enjoyed the details. It is almost like you did take a photograph of the mill. 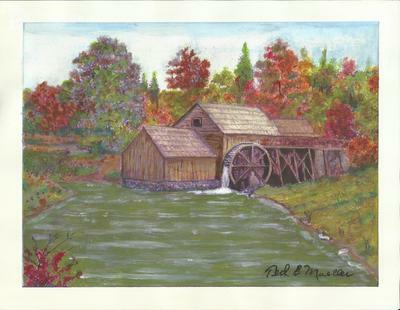 Ted, the picture of Mabry Mill in the Fall is so serene and brings back family memories. My Mom was from West Virginia, and our family had many visits to the Grist Mill at Babcock State Park in WV. Mabry Mill reminded me so much of the Grist Mill and family reunions. Beautiful painting! Great work Ted. These are really beautiful. Keep it up! You seem to give so freely of your paintings. I feel I am a receiver of your work just having been able to view them here. Thank you for the many gifts I have just viewed. I see so many of your beautiful paintings end up as a gift to someone or some cause. God loves a thoughtful giver.. Your presentations here are so inspiring. Some want to take a walk. Some seem content to sit it out. I am one who enjoys your work. I will keep watching for more of your inspirational beautiful works. Someone is going to 'get rich' from your work. Beautiful, as you do have an eye for this beauty. I see the beauty of your paintings and you are right, a photo would not impart the same beauty. 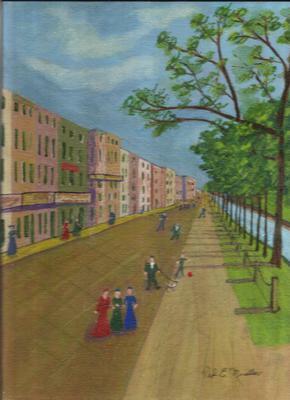 As a member of IArtists I elected to paint a street scene of what Canal Strasse may have looked like in 1900. Chicago area art group IArtists paint about New Orleans — the people, the culture, music and Mardi Gras. And they donate fine art prints to New Orleans families who are rebuilding their homes after the hurricane devastation. A church volunteer camp, that helps the families rebuild, provides a house blessing and a care package of practical household necessities. But man does not live by bread alone, they need beauty and comfort, so a beautiful art print is included to welcome the families home. How great is that? Over 100 fabulous paintings have been created and donated to this project by generous and talented artists. All art is positive and uplifting, no negative reminders of hurricane destruction. The project is funded by public donations, sales of artwork, and fund-raising exhibits. Please support IArtists as we welcome the families home with our gift of art. Many of the paintings are for sale. Prints and notecards are also for sale. IArtists Co. is a 501(c)(3) public charity. So this wonderful painting has been donated to a "Katrina victim" in New Orleans. It will grace someones newly completed home. I would hope the recipient is given something so that they can contact you with a "THANK YOU". You are so generous I would think this at least would require a thank you note delivered via postal services. You deserve it for your generosity. Some are followers - some are leaders. IArtists has a group of dedicated leaders that has helped to erase past gloom and replace it with pleasantries. It appears that TED is such a leader and with all his gifting, is a man to be commended for his gifts. Another gift painting. Looks like Ted donates more of his work as he paints them. This is so refreshing to see something of the past visioned by a present day artist. Someone in New Orleans is going to receive a sort of Rembrandt from this artist. I wish I were on his guest list. This artist has vision. To create something from the past. And the costumes are so of that era. I'm sure someone will appreciate this painting to decorate their home, possibly hang above their sofa. You have created something from the past, presented it in the present as a present. Such imagination to engineer such a feat. 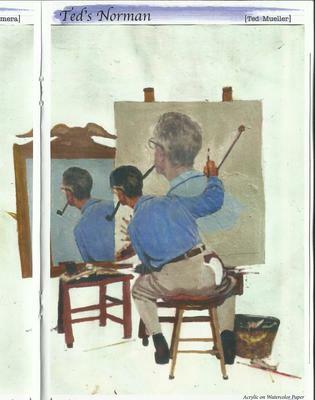 I saw the Norman Rockwell painting from The Saturday Evening Post and admired him for his creativeness. Then the idea came to me, what does his other side look like? Surprising how many people do not realize he is looking into a mirror. So my painting is a SPOOF to evoke humor. I submitted it to "Prairie Light Review" magazine and they accepted it and published it in their current issue. I noticed a notation from a comment of Beth at Immanuel church in Elmhurst, IL. I ventured there and was pleasantly surprised to see 3 religious paintings near the entrance. I noted the signature, Ted E. Mueller. These 3 paintings are exquisite. A painting of the Last Supper, which is also a beautiful carving insert into the alter. All the disciples are "around the table". Another painting depicts Judas, the betrayer, sulking from the room as he was identified by Jesus as the one that will betray him. Then the most recent acquisition is the Last Supper wherein all are reclining on the floor,just as the Bible states, "And they reclined for the meal". Immanuel has a treasure with these paintings and will appreciate in value as years progress. I was overwhelmed with the beauty of all 3 paintings. I like what you did with this Normal Rockwell, clever. and I am inclined to think, he got paid for his work, but yours is good for nothing. Somehow that does not sound right, He got paid and you did not get paid. I think yours is good because it has humor. Exercise, walking, and the HUMOR. I had the opportunity to talk to this amazing artist and had him open up about his background and experiences and careers. What a story he could write, or paint a picture. then later, designed drawings for home interiors, worked as architectural drafts person, worked as an interior store planner and designer for many large department stores. 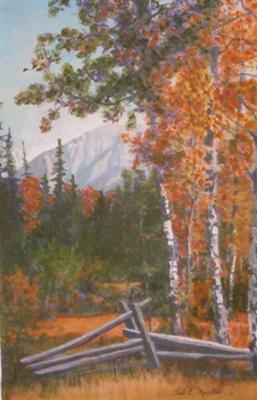 Loves camping and hiking in the woods, which is revealed in so many of his paintings. Then came another revelation: He was a concert performer, a Tenor Soloist at Chicago's Orchestra Hall. Now a new endeavor? PAINTING! 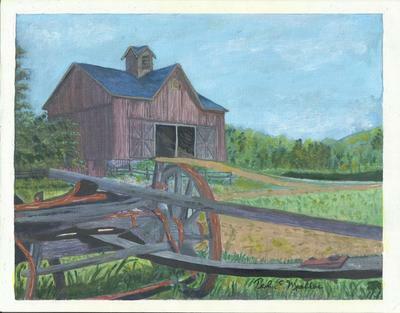 He had all this talent of painting, and now shares it with all who gaze upon his beautiful creations. Such a mufti-talented man he is. And his subtle humor oft times hidden in his paintings. A pleasure having talked with him. I have a copy of this magazine and proudly show it to most everyone I meet and challenge them to find the SPOOF. People are slow. Many time I have to direct their attention to the MIRROR. Then they are embarrassed by their poor observation. I enjoy showing this picture to acquaintances. My copy is getting "battle worn", and I may have to acquire another soon. I love this artists humor, always subtle with a hidden answer. To look in the mirror and see my bum and not have to say,"do these pants make me look fat". This painting is beautiful and absolutely exquisite. I have acquired a copy of the magazine. I located the artist and with magazine in hand, had him autograph it personally for me. His humor is fantastic, and in a art piece that people can have as their own. I cherish knowing this man. I look for more of his creative endeavors. The spoof is........wait for it......if Norman is looking in a mirror then he would see his face NOT the back of his head. Very nice painting Cousin Ted. I love his sense of humor. He seems to be able to create hidden humor in several of his paintings. I myself had to look twice to see the pun, that I SAW IT ! Keep em coming Mr Ted. I look at this picture. The painter is looking in a mirror? I never see anything like that when I look in a mirror. Ted is a real humor creator. I remember his "Healthy Cycle" all vegetables.